Today I found a mint condition Korg Electribe ES-1 MKII Sampler at the local used Music shop here in Nagano-city, JAPAN. It came with the original box, 64MB memory card, adapter, and manual. This particular sampler was something I new I wanted to pick up. I posted a video below from a Youtube user called “harlemnightsmusic” who stuffed a Korg ES-1 MKII Sampler with 80s Linn Drum sounds and started recreating some fantastic classic 80’s disco and pop rhythms. I have quite a few LinnDrum samples among a ton of other drum machine samples and thought this would work perfectly for me. I love the 32kHz “Lo-Fi” sound of the ES-1 MKII very much. There’s only 95 seconds of memory if correct, but that should be plenty for making a few kits for playback. 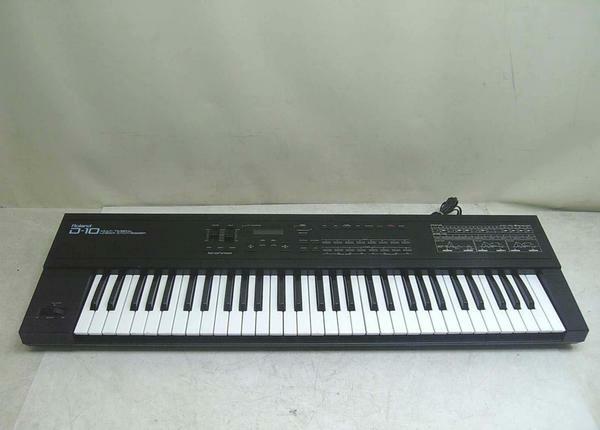 I primarily intend to use Korg ES-1 MKII as a pattern based drum sequencer for me to play along with using the keys. I feel the Korg Electribe ES-1 MKII Sampler will be very easy to program drum patterns which could then be easily transferred to other devices if necessary as well. On a side note, I tested the formatting ability on a 128MB smartmedia card and as expected it gave me an error message. Indeed I will only be able to use up to 64MB Smartmedia cards, however, I likely won’t even come close to using that much since the internal memory can only load 95 seconds worth of samples. Currently I am using a 16MB card and that seems just fine for my purposes. Plus I don’t see myself using this for anything other than a drum machine with retro vintage samples in it. For that it’s absolutely awesome and great fun!! There are quite a few people making great use out of this wonderful sampler on Youtube. I know there are newer updated versions of the Korg Electribe ES-1 MKII, but for the cheap price I bought this for, I’m more than happy with the results. UNBELIEVABLE! Today I snagged a vintage Roland TR-606 from the local used music shop here in Nagano city, JAPAN for only one dollar (thats $1.00)! The unit was really dirty and there was a note that said it didn’t make any sound. I bought it anyway because I couldn’t take their word for it. I’ve bought things in the past from this same shop with notes that said “Not working” when it only was because they didn’t understand or know how to use the music device. I got home and found a working adapter. It turned on right away, but indeed it didn’t make any sound. The reason is that you must know how to operate the unit! I looked up the manual online as I was guilty as well not understanding how to properly use or test the Roland TR-606. I found some instructions on how to access the patterns. To my amazement the TR-606 performed beautifully. In addition, I noticed on the back there were five custom outputs which meant there must have been some sort of custom MOD installed in the TR-606. I spent about an hour cleaning up the drum machine and it looked fairly nice after that. I still can’t believe I found this for only a buck! I also noticed that when I went through some of the patterns that the previous owner had programmed in the TR-606, they were quite erratic. If I had to guess, the owner before me was either into speed metal or didn’t know what they were doing with respect to programming the TR-606. Perhaps that also might explain the type of person that would drop this off at a used music shop and allow it to be sold for one dollar. Obviously, the store owner didn’t pay more than a dollar so he must have gotten the TR-606 practically for free. The beauty of this used music shop I frequent is that the music gear must be working 100% so that they can provide their standard 3 month warranty policy. Otherwise it’s classified as junk and the price is set to simply get rid of it as fast as possible. This is why the store employees usually seem me in the shop 3-4 times a week. I’m pretty sure that Roland TR-606 would not be in the junk box for very much longer. One of the main reasons I am really excited to find the Roland TR-606 is that it has an output trigger ability to send sync signals to my Roland Juno 6 and Juno 106 synthesizers. The Roland TR-606 is really small and by the looks of the controls is probably quite easy to program once I read the manual once or twice. It should work awesome along with the Juno 6 both as a drum machine and a trigger to start the arpeggiator on the Juno 6. Fantastic! Here is a video that someone uploaded to Youtube with the Roland TR-606 Drum machine triggering and in sync with the Roland Juno 6. It’s not a great video but it gives you the idea of both working together. Found a mint condition Novation Drumstation for $50 today in the used music shop called “Hard Off” here in Nagano-city, JAPAN. I don’t know much about it but I know that Novation makes some pretty decent products. 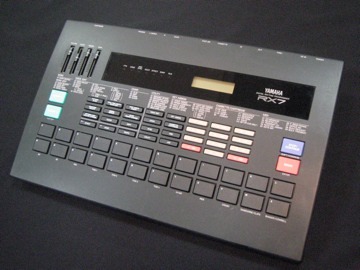 Besides the price being good, the unit had lots of knobs, outputs, and it was very MIDI capable. 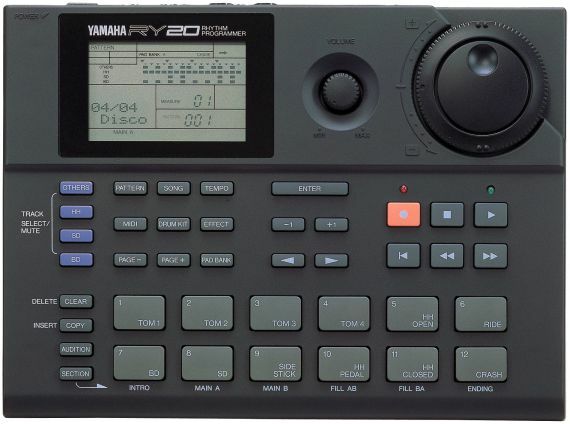 The size was small and it apparently does a decent job of cloning the Roland TR-808 and TR-909 drum machines sounds. I particularly like the fact that you can tweak the bass drum, snare, etc. separately and trigger it all via an external sequencer. The OS of the Drumstation is 1.3 which is the latest OS version if correct. 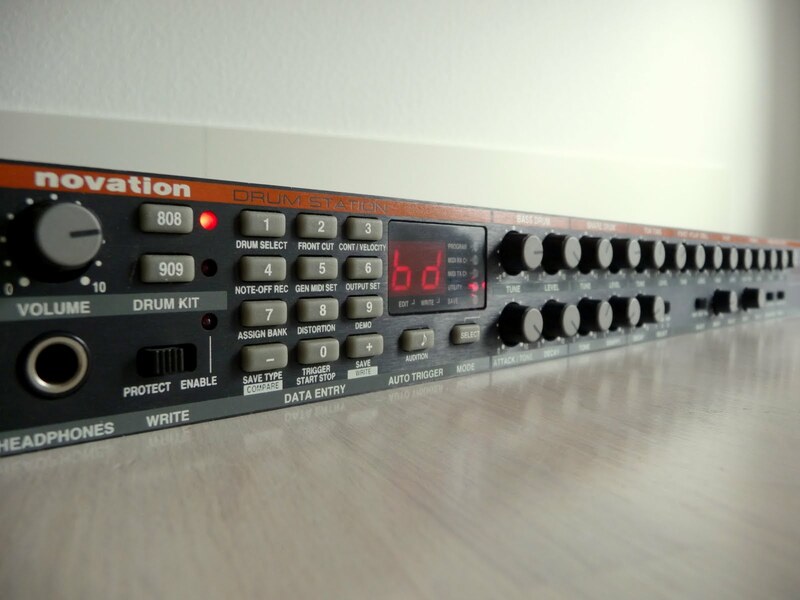 The Novation Drumstation looks like a V2 unit, but I’m not sure. Overall the sound is good and I plan to hook it up to my Korg Triton Rack for making RPPR TR808 and TR909 drum patterns. These patterns can then be triggered by any controller or synth hooked up to the Korg Triton. Once the patterns are playing, I can then tweak the Drumstation to taste and hopefully get some cool grooves going. 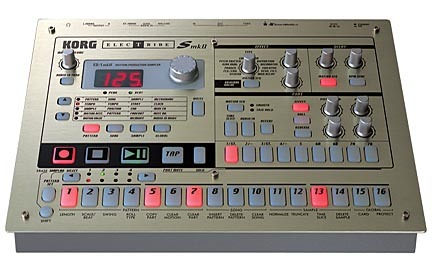 I’m a big fan of the Roland TR808 so having something similar ( but not the same I know ) will be fun. There is also a DIN Sync connection on the back of the Drumstation. Plus I got a PSU4-100 adapter and manual along with the unit. The Novation Drumstation a really neat drum sound module with lots of knobs and it’s very small for a rack. You can basically stick it anywhere and and it will not take up much space.